Destem, rinse and peel the eggplant. Cut into 4cm high chunks and cut the surface crosswise. Sprinkle the eggplants with a bit of salt. Thoroughly coat the eggplants with cornstarch, shaking to remove any excess starch. Heat up a frying pan with enough oil until very hot. Low down the prepared eggplants fry until golden. Drain and plate. Leave a bit of oil in the same pan and heat up. Add in ginger, garlic and chili sauce. Stir briefly and add in stock, salt, chicken bouillon. Bring to boil and thicken with starchy solution. Lightly pour over the fried eggplants and serve hot. Place the lemon juice, olive oil, vinegar and seasoning into a large bowl, and mix together until combined. Thinly slice the carrot and fennel. Rinse salmon and pat dry with paper towel. Brush balsamic vinaigrette over salmon. Sprinkle with pepper and salt or any seasoning of your choice. Brush a nonstick skillet with olive oil lightly over medium-high heat. Place salmon in heated skillet and cook, uncovered, about 3 minutes. Flip and cook another 3 minutes and salmon should be done. Toss the vegetables in the dressing to coat. Transfer the salad to a serving plate and place salmon on top of the salad. Clean the fish and dry them with a kitchen towel. Cut them into 4cmx2cm pieces. Marinate the fish with rice wine, salt and pepper for about 30 minutes. 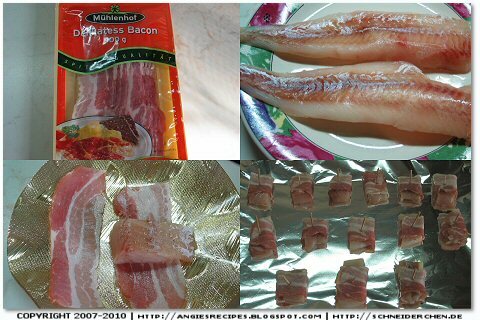 Make the fish bacon rolls by laying a piece of fish on a strip of bacon. Roll up and fasten with toothpicks. Place bacon rolls in baking pan lined with aluminum foil and bake in a preheated 200C/400F oven for about 12-15 minutes. Serve hot. In a bowl whisk together the flour and salt. Set aside. beat the butter and sugar with your electric mixer until fluffy and lemon white in colour. Blend in the egg and orange extract. Sift in the flour mixture and beat at slow speed just until incorporated. Divide the dough into two portions. On one sheet of parchment roll out the white dough into a 24x26 cm rectangle. Wrap dough and place on a baking sheet in the freezer for about 15 minutes or until dough is firm. Combine the sieved cocoa powder with the other portion of dough. Reserve 50 grams of chocolate dough for wrapping the checkerboard dough log. Cover with plastic wrap and place it in the fridge. On another sheet of parchment roll out the rest of the chocolate dough into a 24x26 cm rectangle. Wrap dough and place on a baking sheet in the freezer until dough is firm. Remove both the dough from the fridge and lay the light dough on a parchment paper. Lightly brush the top of the light dough with a little water and place chocolate dough evenly on top of the light dough. Lengthwise cut the rectangle into four strips, each about 6 x 26 cm. Place one strip on a piece of plastic wrap. Brush the top of the dough with water and place the second strip on top of the first, alternating two colours until all four are done. Press down lightly on the top of the dough and then wrap and freeze for 15 minutes until firm. Once firm, remove from freezer and cut the layers lengthwise into 4 strips, each about 1.5x26 cm long strips. Stack four strips, alternating two colours to yield the checkerboard pattern. Wrap and place in freezer again to firm up. Meanwhile roll out the reserved chocolate dough into a 24x26 rectangle on a sheet of parchment paper. Cover and refrigerate until slightly firm or up to a month. Preheat oven to 175C/350F and line a baking tray with parchment paper. Remove dough from freezer and cut the dough into 6 mm thick slices. Place on prepared baking sheet spacing about an inch apart. Bake in the center of the preheated oven for about 10-12 minutes until cookies just start to brown around the edges. Remove from oven and place on wire rack to cool. Baked cookies can be stored in an airtight container up to one week. Whisk the leaven with water, honey and grated potato in a large bowl. Combine the flours and salt. Mix the ingredients together to form a sticky mass. Cover with a cling film and leave for 10 minutes. Spread a teaspoon of olive oil on the work surface. Scrape the dough, working from the side of the bowl, on to the oiled surface. Knead briefly, 20 seconds, will be enough. Clean the bowl, and give it a light rub with olive oil. Return the dough to the greased mixing bowl. Cover and leave overnight in fridge. Scrape the dough on to a lightly oiled work surface and pat it out to form a rectangle, roughly 40cm x 20cm. Fold one end, a third of the length, back to the center. Fold the other end back over it, so you have three layers. Pat it out again and fold it once more. This stretches the dough and aerates it. Leave one hour at room temperature and repeat. Leave another hour and repeat. The dough should be rising nicely. The most important thing to remember is that it's ready to shape when bubbles form in the dough. To check, slash the dough with a sharp razor. If this hasn't happened, leave the dough a further hour and check again. Shape the dough into a ball. Cover and rest for 15 minutes. Dust a parchment paper or a towel and lay it on a tray. Use a flour-dusted, linen-lined basket if you have one. Shape the dough into a baton and place it seam-side up on the prepared paper or cloth. Cover and leave at room temperature until almost doubled, about 3-4 hours. Preheat the oven to 220C425F. Turn the loaves on a floured baking sheet, so that any seams are now underneath. Make a cut a along the loaf’s length. Bake for 25 minutes. Reduce the heat to 180C350F and bake for 45-55 minutes. Remove from oven and cool on a wire rack. Sift the flour into a mixing bowl. Add in ground almond, caster sugar and vanilla sugar. Cut in the marzipan and butter. Add in egg yolk and blend all of them into a dough. Wrap with a cling film and chill for 1 hour. Preheat the oven to 175C/350F. Line a baking tray with parchment paper. Lightly dust your work surface with flour. Roll the dough out to 3mm thick. Arrange the text of congratulations on the cutter and cut out the cookies on the prepared baking tray. Bake in the middle of preheated oven for 10-12 minutes. Cool them on a wire rack. Place cream cheese, milk, 100 grams sugar and freshly squeezed lime juice in a heat-proof pot. Set the pot over a hot water bath and whisk until they become smooth. Soften the gelatine sheets in a bowl of cold water. Gently squeeze the softened gelatine to remove excess water and add it in the warm cheese mixture. Stir until the gelatine completely melted. Beat the whipping cream first at slow speed until the mixture becomes soft and thicker. The cream drops from the whisk when it is lifted. Add in extract and powdered sugar and beat until the cream holds soft peaks. Fold the whipped cream into the cheese batter until combined. Stack together two layers of chiffon cake and slice the cake into 5 rings. Set an 9-10 inch mousse ring on a piece of cardboard or a large serving plate. Starting with 3 cake rings, alternating with cheese filling until have you 4 layers. Smooth the surface and chill until set, about 3 hours. Draw a picture of the checkerboard on a piece of white paper. Cut the checkerboard on alternate squares. Unmold the cake from the mousse ring and surround the side with finger cookies. Place the checkerboard paper on the top and dust with the cocoa powder. Remove the paper and serve the cake. Cut the butter into smaller pieces and place them in a mixing bowl. Add caster sugar gradually at the side of the bowl while mixing, beating thoroughly after each addition. Switch to medium speed to beat sugar and butter until the mixture fluffy and pale. Scrape the bowl down to make sure everything is thoroughly combined. Beat in egg yolk and orange extract until smooth. Add in the flour and fold to combine. Wrap up the cookie dough and chill for 1 hour. Whish together the flour, cocoa powder and salt in a bowl. Set aside. Cut the butter into smaller pieces and place them in another mixing bowl. Add caster sugar gradually at the side of the bowl while mixing, beating thoroughly after each addition. Switch to medium speed to beat sugar and butter until the mixture fluffy and pale. Scrape the bowl down to make sure everything is thoroughly combined. Beat in egg yolk and rum extract until smooth. Add in the cocoa flour mixture and fold to combine. Wrap up the chocolate cookie dough and chill for 1 hour. Divide each dough into 4 logs, about 1 inch in diameter, and reserve about 10 grams of each dough to make the dots. Press one side of each log with your thumb to make a comma shape. Cover and chill 1 hour until firm. Dust a work surface lightly with flour. Place one orange dough log with round side down on the work surface. Brush the side lightly with water and turn the chocolate dough log on top of the orange dough, creating the yin-yang pattern. Gently roll the log until round. Repeat with the remaining logs. Wrap and chill 1-2 hours until firm. Preheat the oven to 175C/350F. Cut the cookie logs into 5mm thick slices. Arrange the cookies on a parchment paper lined baking pan, about an inch apart. Pinch a bit of reserved chocolate dough, and roll it into a small round ball. Gently press it into the orange part of the cookies. Do the same with the reserved orange dough and press them into the chocolate part of the cookies. Bake in the center of preheated oven for about 12 minutes. Cool the cookies on the rack.